Nicked from Lisa at Renegade Parent in her post The-2007 Guidelines for Local Authorities on Elective Home Education. who tells us they "Can be found by clicking on this link to the2007 Guidelines for Local Authorities on Elective Home Education. Just in case any poor soul arrives elsewhere and can't find them. As they seem to have gone missing, why don't you link to them, too? In order that no-one slips through the net (and we know how important that is to Balls and co.) please link back to here - and to everyblogger else who does this." And here we are again giving up nearly a year of our lives to defending ourselves against the Badman Review. Debs at Muddy Bare Feet finds it very hard not to see this latest turn of events as suspect in her post 2007 Elective Home Education Guidelines removed from DCSF website and she links to AHEDs letter to the DCSF asking Where are They? Tech at Freedom of Education Under Threat in her post DCSF Disappears EHE Guidelines down the memory hole finds the the disappearance of the guidelines just before the select committee may need access to them very Orwellian. Be sure to read Elaine's comment regarding a fantasy world of Badmen and virtual schoolrooms. T at Globeonmytable in his post EHE Guidelines 2007 list all the people who may need access to the guidelines. The Jumps post on The Mystery of the Missing Guidelines points out that since the guidelines are still current they should be available. Blogdial explains the memory hole in his post 2007 Guidelines for Local Authorities on Elective Home Education. Lynn at A Life Worth Living in her post 2007 Guidelines for Local Authorities on Elective Home Education thanks fellow home edders for saving a copy. At Home Educating the Puddle Chicks Merry makes the point that these guidelines were paid for by taxpayers money in her post Where have all the guidelines gone?. At Sunnydaytodaymama Sunnymama in her post The 2007 Guidelines for Local Authorities on Elective Home Education tells us where we can find the guidelines and who else is blogging about them. While Ruth at Just Life by the Sea in her post The Mystery of the Missing 2007 HE Guidelines thinks the the DCSF were never really happy with them because they mostly adhered to current law. Annkrozeika at What Shall We Do Today has come back to blogging after a short break in order to make sure the guidelines are available in her post The 2007 Guidelines for Local Authorities on Elective Home Education. While Carlotta at Dare to Know finds that her link to the guidelines very strangely suddenly leads to the Badman Report in her post More on the Missing Guidelines. Firebird at Educating out of the Box in her post Farewell 2007 Guidelines for Local Authorities on Elective Home Education thinks that this proves that the current consultation is a sham and I wouldn't disagree. Home Education Forums report Data Loss at the DCSF. At Not Cricket Vinny finds losing the 2007 Guidelines for Local Authorities on Elective Home Education clumsy and absent minded. And Elaine provides a roundup at Elective Home Education Guidelines 2007 England. Your really couldn't make it up. If so please give me the heads up by email or in the comments section. Well my last post was a test to see if I could do this, based on this post below by a badman group member. We could try google/link bombing. Select some specific words and phrases, then make each of these into a link to favoured websites. The key is to have as many blogs etc do this as possible so that when someone searches on one of these words/phrases, our links are at the top of the search. I think it helps to press the links a lot too. You need a concerted effort of a number of bloggers etc for this to have a real impact on the search engines. There are many more examples you can use. The important thing is that people work collectively to do this. You need people using the same links to specific phrases or it wont work. The phrase "DCSF Select Committee" should link to a page critical of what they are up to. Once you choose a good post for that, you need as many bloggers as possible to ALWAYS link that phrase to that same post. This way, it gets bumped up the search engine listings until every time someone searches on that phrase, your chosen link will be the top suggestion on google etc. I would recommend choosing a second such article/blogpost to link to for when people use just "DCSF". Remember similar search terms. 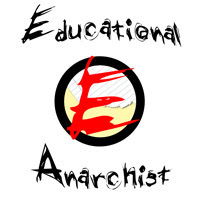 The phrase "Review of Elective Home Education" should have it's own designated link. So should "Elective Home Education", and so should "Home Education". etc etc, each item on the list linking to their designated blogpost/webpage. Include at the end of this list a request for supporters to repost the list on their own blogs, complete with the SAME links. Take the time to click on the links and ask your friends to do that too. Before you know it the search engines will have caught on that your links are the most popular for those phrases. Also - in future blog posts, when you use any of those phrases, use the same links from the list. Its important to be consistent in that. What do people think, is it worth the effort involved in synchronizing our methods? So the DCSF Select Committee are about to scrutinise Graham Badman's Review of Elective Home Education, commissioned by and accepted in full on the day of publication by Ed Balls. And now the Elective Home Education Guidelines for Local Authorities, which the very questions in the original consultation review had suggested breaking have disappeared from the DCSF website. This review is an attempt by government to control our lives and our minds and intrude on our families and it is not just in the matter of home education that they plan to do this. They and the systems they set up are dishonest and incompetent and cannot be trusted. Our Foi asking for the evidence, for Badman's recommendations has been refused . Here is our reply to the refusal. Thank you for your delayed reply to my FOI made on 1st July 2009; it has taken 80 days, four times your legal limit for you to refuse to give us this information. We have some specific comments on your letter. ‘I think it is likely that some confusion has arisen with the statement at paragraph 8.12 of the report of the review which indicated that 'the number of children known to children's social care in some local authorities is disproportionately high relative to the size of theirhome educating population'. Yes and we feel strongly that this misunderstanding could have been entirely avoided if (a) a properly designed questionnaires had been used to collect the data from local authorities in the first instance; and (b) there had been full disclosure of a summary of the data and its sources in the report when it was published. It is unacceptable that so many people have had to make FOI requests to get at the evidence unpinning paragraph 8.12. If there is any confusion it appears to fall at the door of the Department about what constitutes good practice in policy making. We still await the statistical evidence underpinning the claim made in paragraph 8.12. Also please let us know the nature of this error and what the ‘fourth point’ should have said. We unreservedly accept that such personal data should not be released. 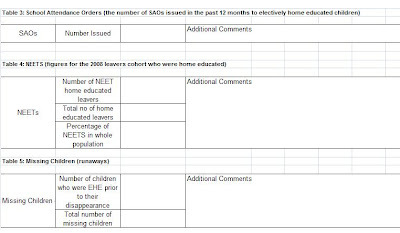 However, we just need to know the proportions of home educated and the proportion of non home educated children for each heading for which data was collected, we need assurances that this is comparable data, and an account of how the data were collected. There is no problem here as aggregate data will not reveal data about individuals. This is not an argument for not releasing the data at aggregate level. (b) endanger the safety of any individual. Again aggregate data cannot do that. This is not a reasonable stance to adopt. The only quantitative claim made in the Review that there is a ‘problem’ with respect to home education and safeguarding concerns is made in paragraph 8.12. The data underpinning this claim MUST be subject to critical scrutiny – something that has not yet happened since it is unclear precisely what data was used, hence our FOI. Failure to scrutinise this data risks implementation of the Review’s recommendations that could cause significant harm to home educated children. At the moment, the evidence unpinning paragraph 8.12 is untested, and the public interest will not be served until it is. The public interest test does not appear to be being applied consistently. The information Commissioner will no doubt be able to see this exchange which has taken place after our referral when using the link we have sent to this conversation. We wish to make some more comments on your letter. The solution is, of course, to redeploy staff so that they can answer the FOIs. Otherwise the department risks looking as though it is being obstructive and stonewalling. 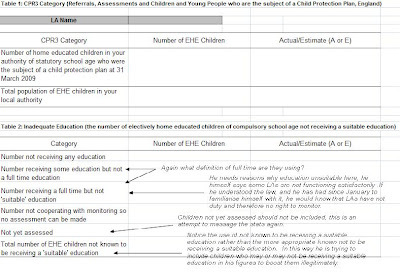 I think it is likely that some confusion has arisen with the statement at paragraph 8.12 of the report of the review which indicated that 'the number of children known to children's social care in some local authorities is disproportionately high relative to the size of their home educating population'. Yes and we feel strongly that this misunderstanding is entirely intentional and if evidence of that is needed it can be found in the absence of any clarification by the DCSF even though this misinformation is damaging actual real children. That Badman is having a third go at collecting the data to support this claim, suggests that any confusion is confined to the Review not home educating parents. It also imples a level of incompetence in collecting data for the Review that is utterly staggering. in paragraph 8.12 as this is likely to be more helpful to you. As background, a copy of information that has already been released to other FOI requesters can be found attached to the Department reply at http://www.dcsf.gov.uk/foischeme/subPage...ollection&i_collectionID=312. There is a calculation error in the fourth point of this release. This has however been released because it is information which the Department holds and which appears to be within - or most nearly within - scope of your request, and which does not engage exemptions under the Act. I understand that the error does not affect the overall findings at paragraph 8.12 of Mr Badman's report. As Delyth Morgan Dawn Primalo is now on record in letters to Home Educators saying that this is not the evidence that the review recommendations are based on I self evidently don’t accept that this is the evidence most nearly within the scope of our request. We and the home educating community are still waiting. Letter contained in this request from Badman via the DCSF. Wonder who asked him to do this so long after the Report has been published and why? Well it’s not exactly the evidence but the claims made from it and its selective use isn’t it. And let’s face it, most of the conclusions. I had a good response from LAs to my call for evidence to inform the Review. challenged, reflecting the sound evidence base. Well as we know that’s another porky, there is no evidence base for the conclusions that’s why he is on hands and knees begging for evidence. Well we are in a position to know that it isn’t a small number and includes a professional statistician, a professional public policy researcher and a retired ofsted inspector. Together with many highly intelligent home educators used to rigorous research in educating their children and answering far too many vexatious consultations from this government. I would like to strengthen (dig some evidence from under a stone) my statistical evidence in advance of the Select Committee hearing so that it is more extensive and statistically robust. This would allow the Select Committee to consider good quality factual information that supplements the qualitative analyses underpinning my report. For this reason I need a response to this letter by 1 October. Why we ask when he is supposed to be ‘independent’ and home educators are unable to ask him questions as he has finished his work on the report? could indicate for each dataset whether the figures are accurate or estimates. return published on 17 September 2009. Wait a minute when I last looked there was no definition of full time. Don’t we need to know why here so we can make sure that the Local Authority is not acting outside the law? Wait a minute when I last looked Local Authorities had no duty to monitor. Again are these judgements valid, we know how often they are not. (please do not include any child more than once). Well if the LA is doing its job this should be the same as children not receiving a suitable education shouldn’t it. showing the number or percentage that were classified as Not Settled in a Full Time Activity, when this survey was carried out, and comparative information for all young people in this cohort. This at least is an attempt at legitimate data collection, shame that the question is wrong. were electively home educated prior to their disappearance. and hope that you will help me make the strongest possible case to the Select Committee in October. I can well imagine. He should have added be careful what you say because my recommendations are about to land you with and immense amount of extra work with an incredibly hostile population and we won’t be giving you a penny to help. Right jumping to conclusions myself, must consider the spreadsheet. Not commenting on this because it has been said above.